Second in the Cabaret Series in The Sharon's Lobby Lounge is Heather Ard in her musical adventure of life, love, spirit, and siblings accompanied by Bill Doherty. Join us as we present our second event of this intimate series on December 12th! Join Heather as she sings about her life living in The Villages, attending mass, raising three beautiful children, and operating through life always with a song on her lips. The evening will be full of entertainment! Some songs will make you laugh, some will make you think, others will make you remember…but they will all be sure to make you smile! Life is a Cabaret! Heather Ard has held many positions throughout her career in entertainment: singer, performer, stage manager, choreographer, and director. She has performed in professional productions throughout the country; favorite rolls including Maria: The Sound of Music, Belle: Beauty and the Beast, and The Narrator: Joseph… Around The Villages Heather can be seen singing at Katie Bell 's, St. Timothy 's Catholic Church and various other venues in the area. Heather moved to The Villages from Orlando in 2014 with her husband, Paul, and their 3 beautiful children. Her involvement with The Sharon L. Morse Performing Arts Center began as Properties Manager with the opening team and she has been a part of the family ever since. Heather is currently the Assistant House Manager for the Sharon. Although Heather 's title has changed throughout her career, her goal has always remained the same: "To utilize my passion for entertainment to bring joy to others." Enjoy the show! Bill Doherty is a pianist, conductor, composer and singer. As a singer, Mr. Doherty has performed 14 leading roles in opera productions throughout the United States and Europe including the Mohawk Valley Opera (NY) and the Tri-Cities Opera (NY), and was mentored by the legendary soprano Licia Albanese (Metropolitan Opera, La Scala). As a pianist, composer and conductor, Mr. Doherty conducted members of the Central Florida Lyric Opera and the St. Timothy Choir in a special Mass of Thanksgiving at the Vatican for Pope Benedict XVI and in concerts in an around Rome, Italy in 2012. In 2014, he presented the world premiere of his original composition "Missa di Requiem" in Jerusalem. Most recently, he returned to the Vatican to conduct and perform the European premiere of his "Missa di Requiem" at St. Ignazio Basilica in Rome, Italy and at the Vatican for the closing Mass of the Jubilee Year of Mercy at the request of Pope Francis. He has conducted and accompanied extensively in opera for over 20 years, collaborating with some of the world's greatest operatic stars including the legendary Licia Albanese and serving as accompanist to world-renowned Metropolitan Opera sopranos Deborah Voigt, Molly Fillmore and Susan Neves. Mr. Doherty is also one of the nation's leading voice coaches and operates a teaching studio in both Florida and New York City. 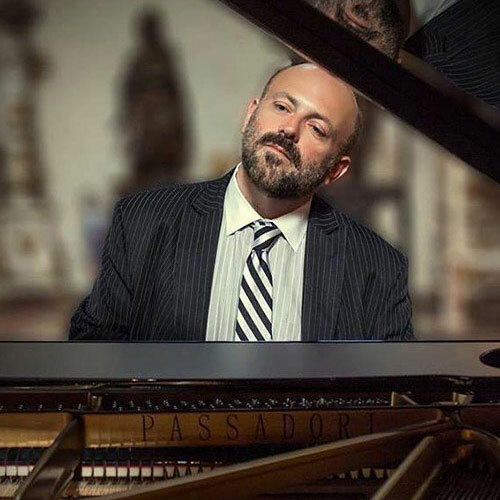 An internationally recognized teacher and workshop clinician, Bill Doherty has conducted Master Classes in opera and voice at universities and conservatories throughout the world, including Marymount Manhattan College NYC, and the Conservatoire Leo Delibes, Ville de Clichy-La-Garenne, France, among others. His interviews and performances have been broadcast on PBS, CBS, and NBC. He has also appeared on various talk shows including the "Late Show with David Letterman". Year after year, for the past eighteen years, Mr. Doherty has served as adjudicator for the Licia Albanese-Puccini Foundation's International Vocal Competition in New York City and has also performed as an accompanist for the Foundation's Gala concert at Lincoln Center, NY. He also is adjudicator for the prestigious Gerda Lissner International Opera Competition, NYC. He is Founder and General Director of the Central Florida Lyric Opera, Inc. His work has been recognized and commended by both Florida Governor Charlie Crist and former United States President George W. Bush. Mr. Doherty is the Director of Music at St. Timothy Catholic Church in the Villages, FL. Among his many other honors and awards, Mr. Doherty is the recipient of the New York State Council on the Arts Humanities Award and his signature has been immortalized on the Muro di Alassio in Alassio, Italy.